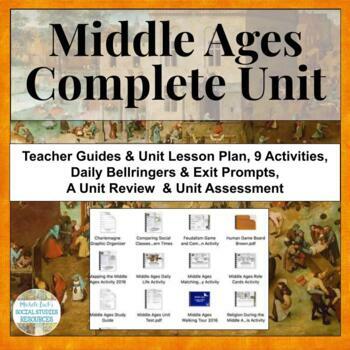 Complete unit for teaching the Middle Ages. Covers the changes from the Middle Ages to the Renaissance, including the Crusades, Feudalism, and the rise of the European Empires. Presentations and Analysis Activities are included with lecture notes and many images and graphics on all major topics, includes student projects and assignments, and bellringers and exit assignments for daily assessment. Includes a Walking Tour, Research Activity and so much more for collaborative learning. 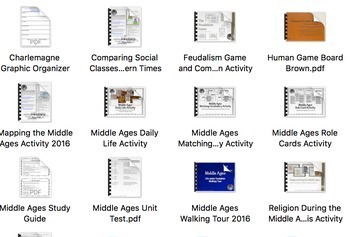 A game on Feudalism is added for student understanding as well as a role cards activity to help students learn the important people and their roles in history. Unit plans are broken into 14 days with daily outline of activities and unit test and study guide are included for general and Special Ed modified. See Daily Unit Plan in Preview and Links to Individual Activities for greater detail on complete package!